The past 6 days have been quite interesting. Preparing for Hurricane Irene (which is no small feat here at the shop!) Riding the storm out hoping a tree doesnt fall on your house and losing electricity which is very humbling. And now the big cleanup! The one good thing about Charlie buying everything big and heavy to sell comes in handy when the winds are blowing! All the yard art has stayed put and no damage done. 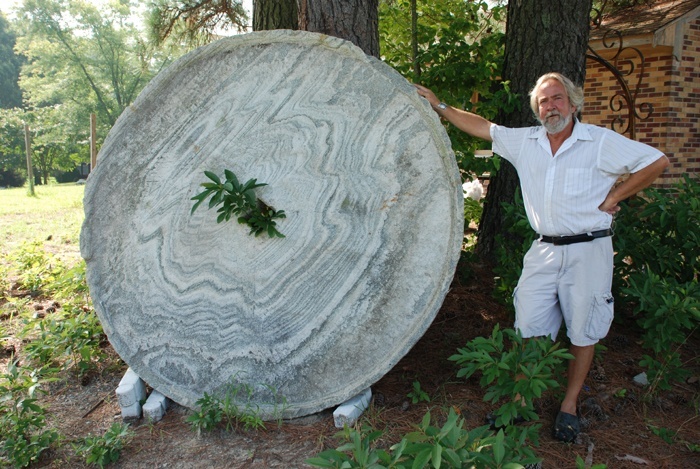 This picture is one of our largest millstones and would make a great table or inlay it into the ground for an instant small round patio or platform for a statue. Boulder finds a new home! The Latest Project!